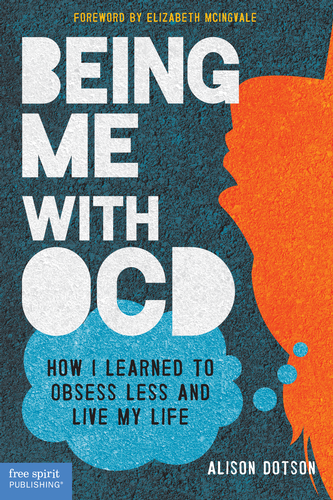 Being Me with OCD will be out as a paperback in March, and I can’t tell you how happy that makes me. When I submitted my proposal, the publisher was interested but hesitant to go forward with a “regular” print book. OCD is a sensitive topic, and they thought teens might feel embarrassed to carry around a book with “OCD” in big letters on the cover. And today’s teenagers and early-20-somethings are more and more connected to electronic devices–more so than my generation, that’s for sure. Wouldn’t they prefer to read a book on an e-reader? Their reasoning was sound. We could reach teens where they are, which is, by and large, online. They could order my book with the click of a mouse, or, more likely, the swipe of a finger. But I still wanted a real, tangible, bound paper book I could hold in my hands. I can’t help it. I love to read; I always have. I grew up with my nose in a book, to the point that my parents were trying to get me to read less. I stayed up too late and never looked out the window as our station wagon wended through scenic countryside. I love books. I love the smell of them, I love the way they feel, I love that they’re portable and nearly indestructible. I read in bed and in the tub. I’ve dropped my books in soap bubbles and slept on top of them. I’ve squished them in suitcases and purses. I crease the spine to get a wider view of the page spreads, and when the paper is soft I rub my hands over it, again and again, unable to pull away from the tactile sensation. So every time I met with my publisher I’d mention that what I really wanted was a print book. They knew. Believe me, they knew. I was, and am, beyond grateful that they agreed to publish my book at all. I’m glad it’s available as an ebook. It’s the wave of the future, after all, and on the bus I see people of all ages reading on Nooks and Kindles. But having my book available as a paperback is important. I don’t have that many friends and family members, but I do have supporters who will buy the paperback just to have it on their shelf, even if they’re not the target audience and don’t necessarily intend to read it cover to cover. And that means exposure. It means a teenager visiting a relative might see it on a side table or in a bookcase and realize it exists, and make a mental note to check it out later. Or maybe even ask about it. A few weeks ago the International OCD Foundation posted an excerpt of my book to their blog, and several mental health professionals commented that it would be a great resource to keep in their waiting rooms or on a shelf somewhere in their practice. Young people with OCD may run across the book this way, and maybe they’ll ultimately still purchase it in ebook form. And that’s okay. It’s been my goal all along to reach as many hurting people as I can, and I think having my book in print is another step in that direction.